Strikingly Unique Feminine Beauty” Trish O Couture presents its 2013 A/W Collection Lookbook – “Beaute Exotic”. Trish O Couture is back with its Autum/Winter 2013 Collection look book titled “Beaute Exotic“. Known for its fairy tale themes, femininity and romantic aesthetic, this collection is filled with black & silver sequins, beautiful fascinators, Ankara prints, leather skirts and velvet features. It is filled with mini and full length dresses, fringe features and ankara tops. London-based Nigerian designer, Ade Bakare, presents his new summer collection called “Sahara“. Characterised by burnt oranges, golden yellows the pieces are heavy with embellishments sequins, flirty floral print and and hints of tribal origins. With fitted ball gowns, charming sun dresses and asymmetrical tops the detailed collection is bold and elemental. The Chidinma Obairi design label is a budding fashion line which started in 2012 with the purpose of providing each customer with unique couture pieces that are carefully detailed and sophisticated. 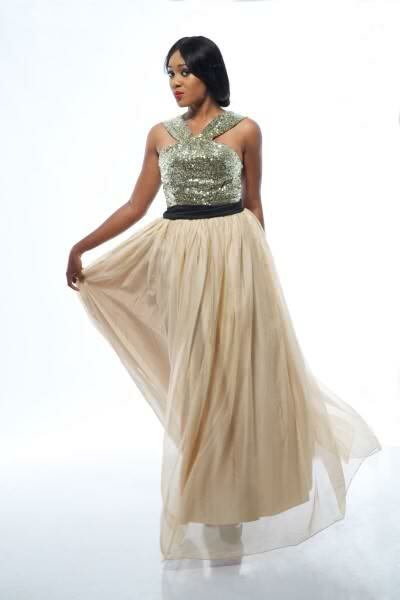 Today, the Chidinma Obairi design label presents its timelessly feminine 2013 collection. Tucked under silk, ankara fabric, sequins and crystals, the collection delicately embodies culture, intricate detailing and femininity. It showcases flirty dresses & skirts to give off a young, petite & girly look.